It must have to be recorded in the consciousness of all sane beings, the driving force behind indefatigability of young Biafrans who are ever prepared to stake their lives for the cause they unrepentantly cherish and believe in. They stage peaceful protests in spite of the inherent dangers attached even in the despotic Nigerian environment. The opponents of such moves have failed to ask themselves the reason propelling these vibrant young men and women to conscientiously brush aside every opposition in their responses to the calls and commands of Mazi Nnamdi Kanu, the resilient leader of the Indigenous People Of Biafra (IPOB), be it in the night or in the day. Has it ever come to the imagination of the ignorant in their numbers, why these young and vibrant Biafrans in their millions prefer to sacrifice their lives for the restoration of Biafra? Contrary to the fear attached to the unrelentless decimation of the Biafran people by the agents of the Nigerian government, the number of these ebullient freedom fighters continue to surge. These young men and women prefer death than living in delusion foistered on them by a system that enslaves and impoverishes them. They will rather die in the process of the struggle for the restoration of their homeland, Biafra than continue to be slaves in a glorified land. This is true because these are the people who have grasped the message of Yahusha as recorded in the book of "Mark chapter 8:35" which says "For whosoever will save his life, that shall lose it, but whosoever shall lose his life for my sake and that of the gospel, the same shall save it." And if you go down to verses 36 and 37, it goes further to question: "What shall it profit a man to gain the whole world and lose his soul? Or what shall a man give in exchange for his soul?". This can only be comprehended by the spiritually minded. Yahusha came to the earth when the wickedness of men was at its peak just like it is today in the evil contraption called Nigeria. The oppressors of that time connived with the rulers and the religious leaders to kill Him because of their depravity but He wilfully submitted Himself to death for which purpose He actually came. And today all over the world, He remains the only source of redemption to humanity. He remains alive unto eternity. These Biafran young men and women who have severally been called names by enemies of justice, equity and freedom, have put their lives on the line for the unfettered restoration of Biafra. History shall never forsake them nor will posterity do for the noble price that is being paid even with their lives, just to ensure that the Kingdom of God (Biafra) is restored and the people liberated from the evil clutches of the Nigerian establishment. 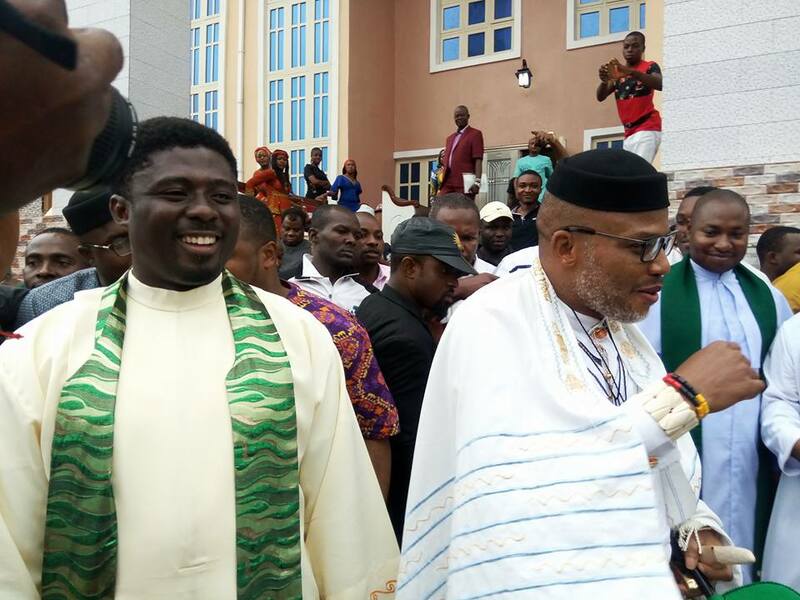 Mazi Nnamdi Kanu has come under the ordination of God, with the synergy and absolute backing of his followers - the Indigenous People Of Biafra (IPOB), to liberate Biafrans and by extension the entire black race. It is in Biafra that the African continent died and it is in Biafra restoration that Africa will be resurrected. This is the timeline set by Chukwuokike Abiama (God Almighty) to deliver the nation of Biafra totally and completely to Biafrans. We prefer carrying on assiduously with this restoration project because that is the only way this wickedness of many generations against Biafrans can end. The tyrannical and vampiric governments of Nigeria can only be truncated through this most civilised approach chosen and clinically being employed to realise our objectives. It is disheartening however, to state here that the elected representatives of the Biafran people have shamelessly covenanted with the devil at the expense of the welfare and well being of their people even in this 21st century because of selfish interests. All the evil plots of these saboteurs of Biafran extraction with their collaborators bent on thwarting this struggle, will be shamed at the fullness of time. And because of their naivety and trivial desires, they stood in obedience to the demands of their futajalonic slavemasters, to tag armless, harmless, peaceful Indigenous People Of Biafra, terrorist organisation thereby paving the way for a brutal, Islamic, vampiric military to invade Biafraland unhindered not just only to intimidate Biafrans into surrendering the struggle but maiming and killing them as well. But Biafrans are uncrushable and are determined more than ever before to see to the restoration of Biafra come to existence. Our minds are made up even to DIE TODAY THAT THE UPCOMING GENERATIONS WILL LIVE TOMORROW. The truth remains that Biafrans of today can never be subdued like our fathers, the array of military armour notwithstanding. We are out to have Biafra fully and imminently restored by our generation. The Biafran restoration project is divinely orchestrated and if God whom we serve and depend on can never be defeated, then we can never be defeated. No matter the deluge of satanic antics employed to try to stop us, the Indigenous People Of Biafra (IPOB), or possibly kill Mazi Nnamdi Kanu, our leader, there are millions of more deadly Nnamdi Kanus scattered all over the world and in Biafraland that will fight to birth the Biafran nation. The history of Pharoah of Egypt and his Army shall not be forgotten in a hurry and I believe that the enemies of Biafra are aware of that event. .
We will never capitulate until this restoration project is achieved. Our aim of completely destroying the evil dynasty of Nigeria with the truth can never be compromised. The Indigenous People Of Biafra (IPOB) under the able leadership of Mazi Nnamdi Kanu remains unruffled by the fruitless machinations of the Nigerian state targeted against us. We can never be stopped. There is absolutely no going back on our stand. There is absolutely nothing like restructuring. "No Referendum, No Election" in the entire Biafraland. This is our uncompromising stand! "No Referendum, No Election in the entire Biafra land." I agree 1000%. The Sovereign State of Biafra must be pursued to its logical conclusion.